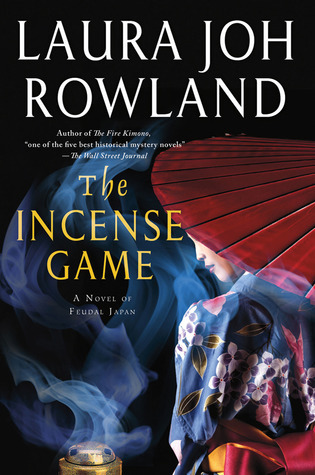 I recently finished book sixteen in Laura Joh Rowland’s Sano Ichiro Mysteries Series, The Incense Game. I know I’m nearing the end of the series, there are only two more books, and while all good things must come to an end, I hate to see it actually happen. I started several years ago with book ten, The Assassin’s Touch, and made a promise to myself that I wouldn’t go back to the beginning of a series that I really didn’t have time for. Even though book ten read like a stand-alone novel, I fell in love with Sano and the cast of characters. Combined with my love of all things Japanese, I immediately broke my promise, started reading from book one, and now own all of them except for the final book. Most of the mysteries I have read are because I stumbled upon them in a library where they had been mislabeled as regular fiction. Book ten of Ms. Rowland’s series was on the new book shelf, and the picture of a Japanese woman with a fabulous dragon tattoo drew me in. As someone who usually bypasses the shelves of mysteries, I was hooked. All the books are rich with history from the era of the shoguns. Ms. Rowland seamlessly blends historical figures and events with fictional ones to create believable storylines. She adds a dash of the mystical martial arts to ramp up the tale without coming across like a poorly dubbed foreign film. Sano is a realistic hero because he suffers trials and tribulations as well as successes. Of course for Sano, either situation constantly places him in a good light with his allies and a bad one with his enemies. The tension and struggle is real, and often frustrating, as the reader will want Sano to act in such a way that looks like it would resolve all his problems. However, he is bound by obedience to bushido which governs his every move. There is always a bad person behind the mysteries Sano investigates, but the best antagonist throughout the novels has been Yanagisawa who, on top of everything else Sano endures, is constantly trying to get rid of him by whatever means necessary. No scheme is too diabolical for Sano’s archenemy including attempts on the life of Sano’s wife and children. The cast of peripheral characters—Sano’s wife, children, friends, retainers, the Shogun—add to the depth of storytelling I have come to love from Ms. Rowland. The one character I hated to see go by the wayside was a love interest for Sano in an earlier novel. I would have liked to have seen Aoi, a beautiful woman trained in the ninja arts, to make a reappearance in a later book. This worthy character definitely would have heated things up especially if she returned after Sano married. If you haven’t read Laura Joh Rowland’s Sano Ichiro Mystery Series, I strongly suggest you do. Take it from someone who is extremely picky about her mysteries, you won’t be disappointed. I hope you enjoy it, Robert!